Size: 13.5 x 11.5 x 6"
Keep your gear protected from the elements while traveling or during extreme shooting conditions in this yellow Watertight 101075 Hard Case from Condition 1. This hard-shell case is airtight and waterproof up to three feet for 30 minutes. It has an O-ring seal and is designed to withstand the rigors of extreme conditions while traveling in the field. You can open it via the two spring latches, which feature lock holders for an optional padlock. An auto-pressure equalization valve works to keep contents secure during air travel while the Pick-N-Pluck foam provides secure customized padding for your gear. A convoluted foam lid ensures your contents stay put during the most tumultuous of journeys. Carry the case with the durable top grip handle, featuring finger grooves on each side to make lifting easy. The case is stackable which comes in handy when you are traveling with multiple cases. It is made in the USA. 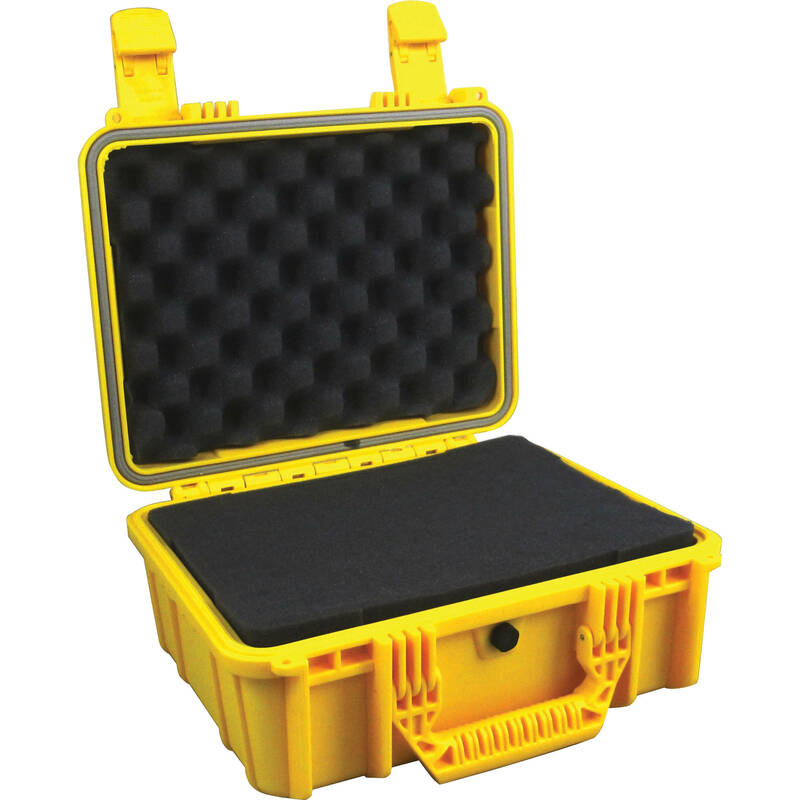 Box Dimensions (LxWxH) 14.0 x 12.4 x 6.6"
Watertight 101075 Hard Case (Yellow) is rated 4.8 out of 5 by 8. Rated 5 out of 5 by Justin from Excellent Small-Size Case I wanted to purchase the Condition 1 Watertight 101075 Hard Case (Orange) for my truck to put emergency first-aid materials in it. It stands out and is watertight, which is helpful for wet emergency conditions that we all meet on the road at times. Great product and B&H makes it easy to purchase. Thanks B&H and Condition1 Case Companies! Rated 5 out of 5 by Outdoor Geek from Best Case for the money!! I have a few of this companies cases and they are a great buy for the money. They are light weight, the latches are awesome, spring loaded and you can open with one hand or finger if needed. Some of the other cases out there are almost painful when trying to open. Rated 5 out of 5 by Digi-TVpro from Rock Solid Storage Box I use this case to protect sensitive video production equipment (specifically an expensive 7 inch field monitor). It is as good as any of the more expensive ones I've had in the past and for considerably less. I'll definitely purchase this brand again. Rated 5 out of 5 by Ben T. from Love it - will buy another! Love this. It's probably a little overkill for my use for some small video equipment, but it's awesome. The pick and pluck foam is awesome for customizing your layout. I haven't dropped it or anything like that but know it would absorb it. Rated 5 out of 5 by Efrain from Convenient and Versatile I use this case to store and transport multiple VHF Marine Handheld Radios and their accessories. It works great. It's size is convenient and overall a very versatile case. Rated 4 out of 5 by Photoghog from Very Nice! Great medium size case! I put this thing through the ringer and it kept my optics dry and in perfect shape! Rated 4 out of 5 by Roadrunner Child from Good buy great case, using for pistol case, works great for pistol and a few extra mags. Latches are sweet! Rated 5 out of 5 by BobbyHobby from Awesome Case1 Great case all around.